There have been a tiny handful of incidents since he went to Washington in 2015 in which North Carolina’s junior senator, Thom Tillis, seemed to at least hint that he might have some semblance of an inclination to stand up to the extremists on radical right. Early on in the outrageous blockade of Obama Supreme Court nominee Merrick Garland, Tillis bucked conservative powers-that-be for about five minutes by briefly suggesting that Garland should get an actual hearing. He quickly backtracked on the statement, but it was at least somewhat encouraging to know that Tillis had to be told to abandon all decency and honor on the matter rather than doing so naturally and as a matter of instinct. More recently, the senator uttered at least a few semi-moderate words of concern about Trump’s heinous Muslim ban effort. Again, Tillis’ “objections” amounted to little more than momentary peep, but hey, under the standards in force in Washington now (in which even supposed mavericks like John McCain and Lindsey Graham stick with the Trumpists almost 100% of the time), it was better than nothing. 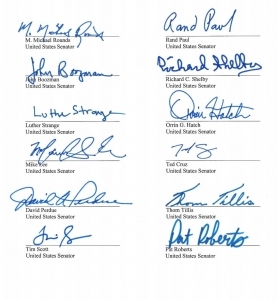 A group of 22 Republican senators signed a letter urging President Trump to make a “clean break” from the Paris Agreement on climate change. The letter, dated May 25, commends Trump for signing 14 executive orders to roll back regulations established under the Obama administration. It singles out the “Promoting Energy Independence and Economic Growth” order for beginning the process of dismantling former President Barack Obama’s Clean Power Plan regulations. “Because of existing provisions within the Clean Air Act and others embedded in the Paris Agreement, remaining in it would subject the United States to significant litigation risk that could upend your Administration’s ability to fulfill its goal of rescinding the Clean Power Plan. Accordingly, we strongly encourage you to make a clean break from the Paris Agreement,” the letter reads. To which all a caring and thinking person can say is: Good grief! Even Richard Burr avoided signing this disaster. By lending his name, Tillis has truly aligned himself with what is likely the most dangerous cause of the most dangerous presidential administration in American history. It’s yet another sad day for North Carolina.